Over the past 30 years, arguably the most significant innovation in environmental policy has been the introduction of policy instruments that rely upon market forces to control pollution. You may know it as “cap-and-trade.” This policy debuted in the Clean Air Act Amendments of 1990 and has since spread from a focus on acid rain in the US to the development of carbon markets around the world. China is the most recent large emitter to announce a national carbon market. This talk by Dan Dudek at the Bren School of Environmental Science and Management at UC Santa Barbara reviews the major innovations of this policy tool, its migration around the world, and prospects for the future. 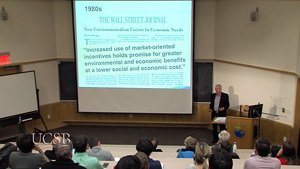 Dudek joined the Environmental Defense Fund in 1986. He has participated the development of several environmental initiatives including the Montreal Protocol, the US acid rain program, the Kyoto Protocol, and California’s AB-32. He has been an adviser and consultant to numerous governments and organizations. He has served on the Secretary of Energy’s Advisory Board; US EPA advisory committees; and on two councils that personally advise China’s Premier on environmental issues. He launched EDF’s China Program in 1995 to develop programs for the control of both conventional and greenhouse gas emissions. His work now focuses on India’s air quality problems. Watch From the Adirondacks to Beijing: One Economist’s Journey.